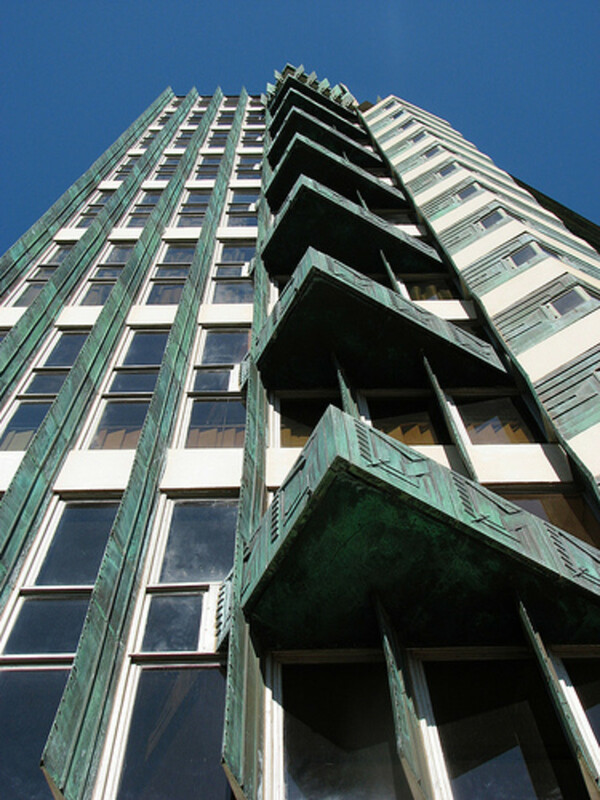 The Price Tower in Bartlesville, Oklahoma is the realization of a dream for famed architect and designer Frank Lloyd Wright. First conceived in the mid-twenties, it would take nearly thirty years before Wright would have a chance to build his first and only skyscraper. Frank Lloyd Wright was a visionary. Through his innovative thinking and love for design, he revolutionized our preconceptions about modern architectural designs. His designs typically incorporate a wide variety of organic architecture, which promotes harmony between human habitation and the natural world. In a word that he used to refer to his designs, these Usonian structures made use of native materials, natural lighting, and a strong visual connection between the interior and exterior spaces. This organic architecture is present in every building that Frank Lloyd Wright created. The Price Tower in Bartlesville is no exception. Inspiration struck Frank Lloyd Wright in 1924. The National Life Insurance Company was expanding and needed a new office complex to house its employees. Wright was chosen to design the offices. After months of research, he finally submitted the plans to the company. Ultimately, the plans were rejected and Wrights vision of his towering skyscraper was dashed. A second chance came five years later. In 1929, he was asked to design the St. Mark’s-in-the-Bouwerie apartment building. With little modification to his earlier plans, Wright once again submitted his draft. Once again, his designs were rejected. Finally, as he approached the age of ninety, having waited 27 years, Frank Lloyd Wright succeeded in creating his first and only skyscraper.